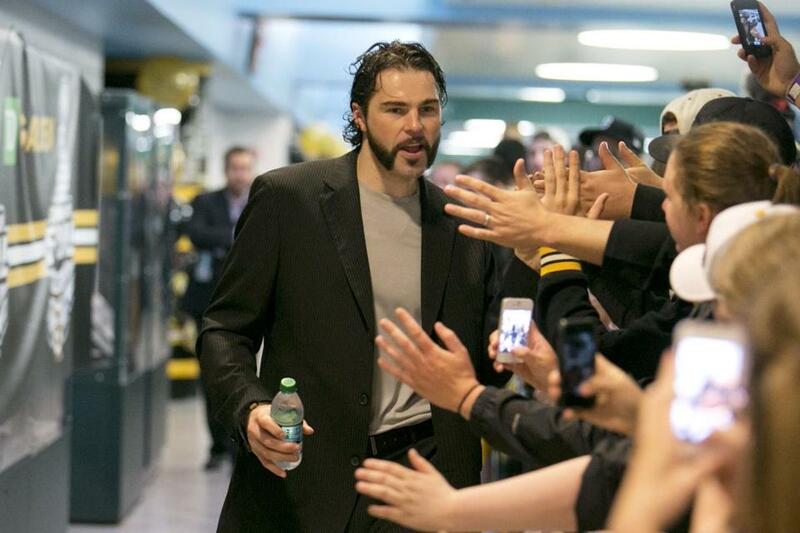 Jaromir Jagr greeted fans before the Bruins left Boston on Tuesday. CHICAGO — Jaromir Jagr is like an NHL time capsule. He is a man from another era, when the hair was longer, the goals were more artful, and tweeting was something you did when you tried to talk after you had a few teeth loosened. The last time Jagr laced ’em up for a Stanley Cup Final — as he will do on Wednesday night for the Bruins against the Chicago Blackhawks — was June 1, 1992 in Chicago. He scored the opening goal in Pittsburgh’s 6-5 win at now-defunct Chicago Stadium that completed a four-game sweep and gave the Penguins their second straight Cup. He was 20 years old. One of his teammates was Hall of Famer Bryan Trottier and one of his opponents was Jeremy Roenick, who is now a studio analyst for the NBC Sports Network. Jagr is 41 now, dying his beard to disguise the salt and pepper. They should play Elton John’s, “I’m Still Standing” when Jagr takes the ice. The Bruins’ rent-a-right-wing finds himself back in the Final in the same city where he last skated for the Cup, when current teammate Tyler Seguin was 4 months old. That 21-year gap between playing for championships is the longest any player has endured in any of the four major North American sports. It’s a testament to Jagr’s genes, longevity, and adaptability that he’s still playing. Jagr hasn’t lost his sense of humor over the last 21 years, which included a three-year stint in the Kontinental Hockey League in Russia. He joked that in the old Chicago Stadium, which closed in 1994, you knew what kind of shape you were in before you hit the ice because you had to climb the treacherous and vertiginous 20-plus steps to get to the rink. “You got tired before you went to the game because you have to go to the steps,” said Jagr. He also joked that hockey-hair mullets will make a comeback in 10 years or so. The mind is just as keen and the hands are still capable of puck prestidigitation. But Jagr, who ranks in the top 10 on the NHL’s career list for goals (681, 10th) and points (1,688, eighth), now runs on regular instead of premium unleaded. He is more of a Prius than a Porsche. Still, Jagr has been effective for the Bruins, particularly since coach Claude Julien moved him from the third line to the second line, with left wing Brad Marchand and center Patrice Bergeron, for Game 7 of the Bruins’ first-round series against the Toronto Maple Leafs. He hasn’t scored a goal this postseason, which is more bad luck than lost skill, but he has seven assists, three coming in the Eastern Conference finals against the Penguins. Having Jagr on the 2012-13 Bruins is a bit like having Tom Seaver on the 1986 Red Sox. Seaver was a wraith of his former transcendent self, but still talented enough to make an impact. Coincidentally, Seaver was also 41 when he was acquired by the Red Sox from the Chicago White Sox midway through the ’86 season. In his glory days, Jagr, a five-time NHL scoring champion, regarded defense as an unnecessary evil. However, the times are a-changin’ in the NHL and Jagr had to change with them when he changed teams in an April 2 trade that delivered him from Dallas, the Bruins’ consolation prize for losing out on Jarome Iginla. Jagr has endured so long that some of the players he’s playing with and against this series grew up idolizing him. Bruins defenseman Matt Bartkowski grew up a Penguins fans, as did Blackhawks forward Brandon Saad. Chicago captain Jonathan Toews declared Jagr was one of his favorite players growing up and that he wore his number in summer league and used Jagr’s brand of stick. In athletic terms, he’s so old you might need carbon dating to place him. Jagr has waited a long time for the opportunity to skate for the Stanley Cup again. “When you’re young you don’t really think about how tough it is,” said Jagr of reaching the Cup Final. Time dulls a lot of things, but it enhances appreciation of a grand opportunity.